Despite recent efforts to reduce food waste on campus, the University’s three dining halls together generate almost 42 tons of composted, discarded meals annually. Some 1,980 gallons in total of food waste of varying weight are collected every week from the three dining halls by the Resource Center, a Chicago-based composting company, according to its director, Ken Dunn (AM ’70). 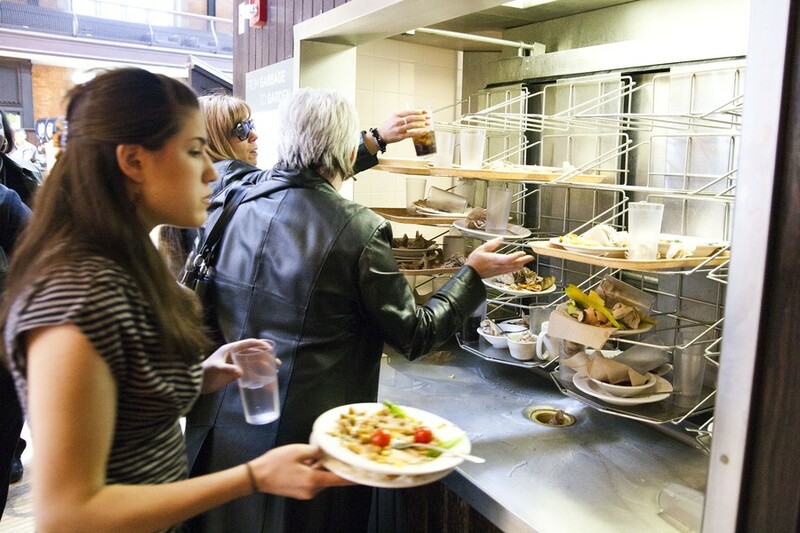 Richard Mason, director of campus dining, estimates that the three cafeterias produce 84,000 pounds of waste every year, not including leftovers from food preparation, such as meat trimmings and vegetable stocks. All of it is composted. While Pierce produces 20 bins for pickup twice a week, South Campus contributes only 10 total each week, and Bartlett 16. The Resource Center has had to pick-up bi-weekly at Pierce for two years, according to Dunn, and has noticed an increase since last spring, but he was unsure of Fourth Meal’s relation to the increase. Depending on the contents of the 32-gallon collection bins housed at each cafeteria, a bin may weigh between 50 and 200 pounds. A few of those bins may only become half or two-thirds full before the next pickup date. According to Dunn, when the dining halls switch to disposable dishes because of technical issues, they only fill each 32-gallon container with 20 pounds worth of compost. One of the most conspicuous examples of food waste is hardly eaten fruit, according to Dunn, which he said is unfortunate. “The earth gave itself to produce this fruit, and we shouldn’t be sending it to composting without benefiting the consumer,” he said. Students claim that the problem lies with the way the University serves its meals. First-year Alyssa Mallory, who was discarding some of her dinner at Bartlett, said that portion sizes are too large. She added that availability of choice adds to the waste. Dunn agreed, stating that the amount of waste is due to the variety of dishes. “You’ll often see a half-a-tray of chicken or a half-a-tray of lasagna; they prepare enough in case everybody wants each of the selection,” he said. Fourth-year Matt Lee, who also was stopped at the dish rack, said that he wouldn’t throw so much food away if it tasted better. “Honestly, if it were good food, I would’ve eaten it. That was the intent [to clear his plate], but every time, I leave this place disappointed, and it’s been four years,” he said. Mason says that the dining halls are working to improve. “We know how many servings get taken and what gets returned, and we use that information and look at the recipe or menu and use that information accordingly,” he said. The University also has to be cognizant of how much the Resource Center charges for composting, which is calculated based on volume instead of weight. Dunn could not say how much he bills the University, but industry averages for composting services in Chicago are between $40 and $80 per hour for trucking time and $0.03 per pound of material collected, according to Dunn. All told, the Resource Center’s only larger client than the U of C is Kendall College, a culinary institute on Goose Island. “It adds up to quite a bit,” Mason said.